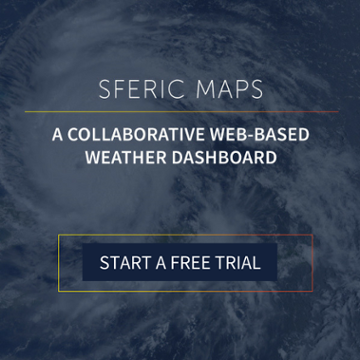 We are coming up on our one-year anniversary of launching the next-generation of weather visualization, Sferic Maps. It’s been exciting to hear the tremendous response from the launch over the past year. Being a customer-driven organization, we continue to add new enhancements based on product suggestions from our users. We have big things in store for the product. With that in mind, let’s go over some of the key Sferic Maps product updates we’ve recently rolled out. Tropical Storm and Hurricane Updates – Just in Time! 2017 was an incredibly active hurricane season with 17 named storms. The three most extreme hurricanes – Harvey, Irma, and Maria—caused essentially all of the season’s $281.14 billion (USD) total damages. These megastorms can easily be tracked in Sferic Maps with our tropical storm and hurricane layers. Views of Atlantic Active Storms, Atlantic Historical Storms, and the Tropical Spaghetti Track Plot helped organizations in Florida and Texas prepare for Irma and Harvey, respectively. The updates also included features for the Pacific Hurricane Season as well, including both active and historical storm layers. We also released interactive enhancements that resulted in Sferic Maps being easier-to-use and even more intuitive. Now it’s even harder to miss a severe weather alert because the triangle notification icon now changes colors, blinks, and makes a sound when there are unread alerts. 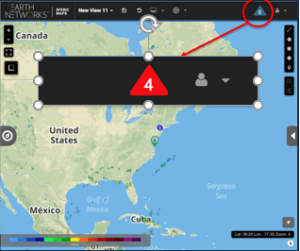 It also shows the number of alerts, which is great for customers monitoring more than one weather condition or location. In addition, you can now center the map to your current location without having to scroll east, west, south, and north. Just click the centering button and a green icon will display on the map representing your current location. You’ll now easily see how far away a storm or lightning strike is from your current position. With Old Man Winter dumping more snow and blizzard conditions on the northern tier of the United States well into March, these layers are becoming long-term tools for organizations located in those areas. These probability forecasts break down accumulation into time frames and amounts so that you can make whatever decisions you have to more quickly and accurately. What Updates Have You Been Using? Comment below and let us know what Sferic Maps product updates you’ve been using the most over the past few months or what features you’d like to see in the future! 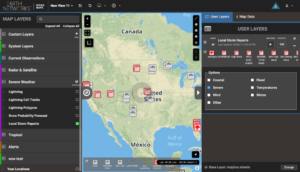 If you haven’t tried Sferic Maps yet, start a free trial today.